2013 Unique trailer Aluminum trailer 2013 20' Unique single axle aluminum trailer. Fresh water used only, never used in salt water. A 20' Sea Fox came off of this unit. 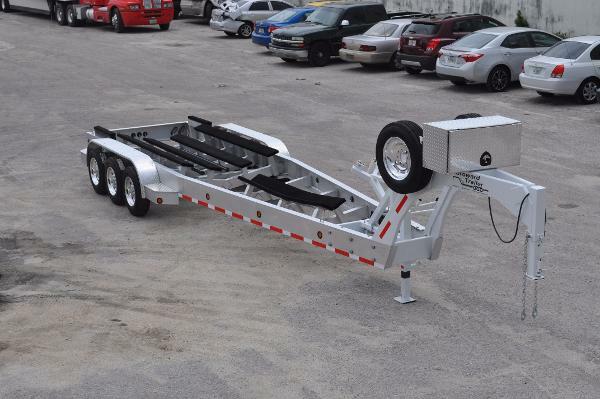 The trailer features, diamond plated fenders, aluminum frame, galvanized rims, bunks, no rollers, buddy bearings, side guides, winch and a tongue jack. No brakes were installed on this unit. Very low miles and no damage to the entire unit. All lights work. Call for more information. 2016 Broward Trailer BAT45-213 The BAT45-213 is a 45', 21,000lb GVWR Aluminum Tagalong boat trailer that we custom built for a Donzi 38 ZX. The main frame is constructed of 12x4 aluminum channel and 6x3 aluminum channel and painted in Awlgrip Jet Black. The carpeted bunks are CAD designed for a custom fit to perfectly cradle the hull. Stainless steel fasteners are used throughout the trailer. DeeMaxx disc brakes are modulated by a Hydrostar electric/hydraulic actuator. Tires are Goodyear on 16"x7" Alcoa Aluminum wheels. The 7,000lb Dexter torsion axle hubs with EZ-Lube bearings are protected from water intrusion by Air Tight Sport Bearing Protectors. Fenders are Polished Stainless Steel with Aluminum Diamondplate Steps. All lighting is LED and the wiring is all run inside of wire loom or tubing for protection. A bow stop with hand winch is included for ease of boat loading. A drive guard with swing gate is included to protect those pricey high performance outboards during transportation. 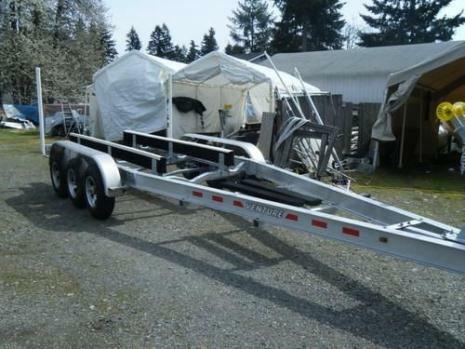 2015 Broward Trailer TABG48-183 Broward Trailer,TABG48-183,Auto-Boat Gooseneck Transport,48' Auto and Boat Gooseneck Transport Trailer, 18,000lb GVWR. Also available in a 53' version. You can carry both Cars and Boats with this trailer! It is the ultimate transport trailer! Equipped with three 6,000lb Dexter Leaf Spring Axles with EZ-Lube Bearing System and 8 on 6-1/2" hubs with 9/16" heavy duty studs, Electric Drum Brakes, 2"x8" Main Frame Steel Tubular Construction, 2-5/16" ball or 2" SAE kingpin 5th wheel coupler, Radial "E" Rated Tires, Steel OEM 16"x6" Wheels, Dual 12,000lb Spring Loaded Drop Leg Jacks, LED Lighting, 7' Auto Loading Ramps, 2 spare tires, Steel Fenders with Heavy Duty Supports, Emergency Breakaway Battery System with self test feature, Safety Chains and 7 way RV style Electrical Plug . 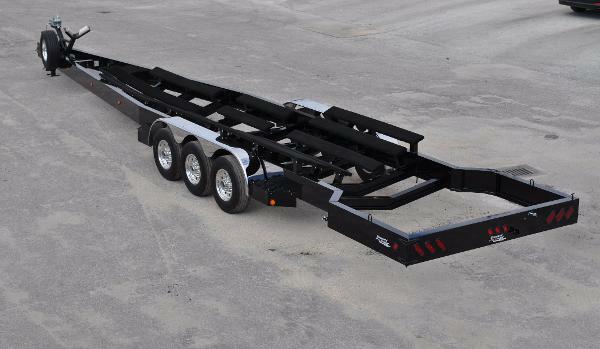 The Universal Bunk System which is standard on all Broward Trailer Transports allows you to move the standard bunks all over the trailer making it easy for you to transport boats of all types. 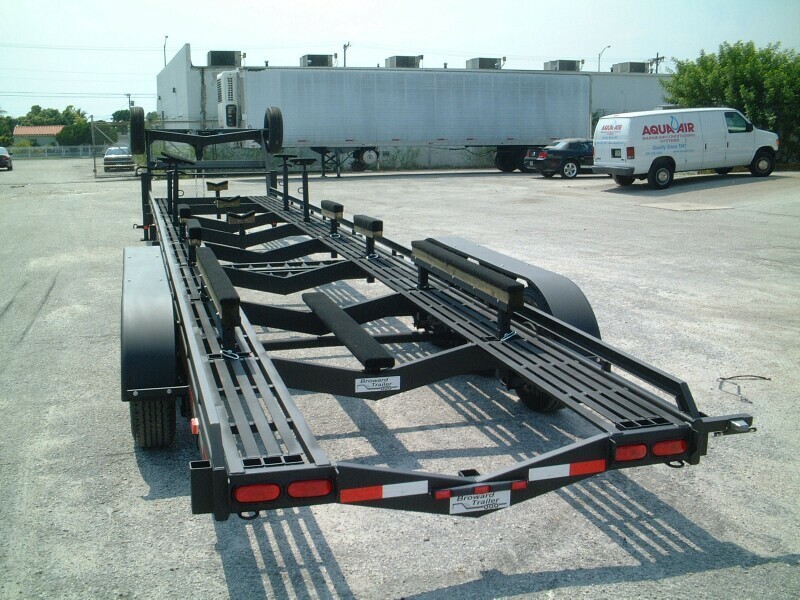 The trailer is built with crossmembers every five feet for extra strength. There are 7 bunk holders on each crossmember allowing you an infinite number of bunk arrangements. The standard carpeted adjustable bunks supplied with the TABG48 trailer are two 6' straight (2 post), four 2' straight, three V-block and four adjustable height screw pads. Bunk holders are located on the outside of the main frame for optional Boat Racks. Options such as Winches, Aluminum Fenders, Flexible Fenders, Throw Bins, Tool Boxes, Sailboat Keel Pads, Rock Guards, Aluminum Wheels, Alcoa Aluminum Wheels, Goodyear Tires, Disc Brakes, Electric/Hydraulic Brake Actuators, Air/Hydraulic Brake Actuators, Air Brakes, Boat Racks, Custom Paint Jobs and Air Tight Commercial or Sport Bearing Protectors are all available. If you can dream it, we can build it! 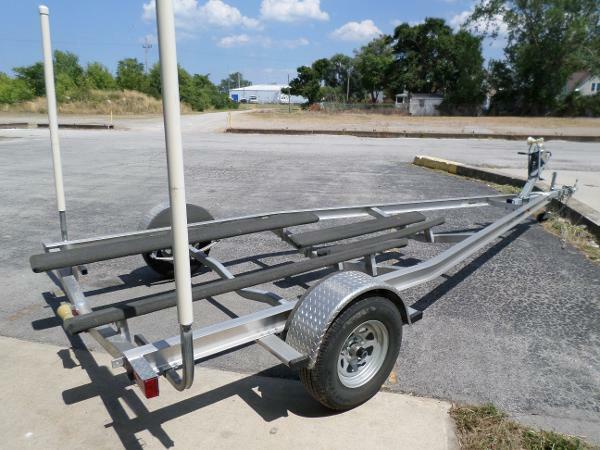 2016 Broward Trailer BCG35-243 The BCG35-243 is a 35', 24,000lb GVWR Combination Aluminum and Steel Gooseneck boat trailer that we custom built for a Carolina Classic 28. The gooseneck section is constructed of 2x8 and 2x6 rectangular steel tubing that has been sandblasted, primed and painted with Awlgrip Matterhorn White. The main frame is constructed of 12x4 aluminum channel and 6x3 aluminum channel. The carpeted bunks are CAD designed for a custom fit to perfectly cradle the hull. Stainless steel fasteners are used throughout the trailer. The steel gooseneck is isolated from the aluminum main frame with stainless steel liners so there cannot be any galvanic action. DeeMaxx disc brakes are modulated by a Hydrostar electric/hydraulic actuator. Tires are Goodyear on 17-1/2"x6-3/4" Alcoa Aluminum wheels. The Dexter torsion axle hubs with EZ-Lube bearings are protected from water intrusion by Air Tight Commercial Series Bearing Protectors. Fenders and steps are Aluminum Diamondplate. All lighting is LED and the wiring is all run inside of wire loom or tubing for protection. A bow stop with Electric Winch is included for ease of boat loading. 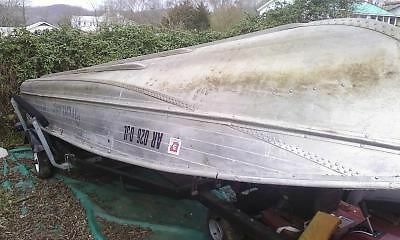 1986 Seyler F-22 Cuddy, 150 hp Suzuki and float on tandem aluminum trailer. Stepped hull for improved efficiency and ride. New transom. Nice Carolina flare provides a dry ride. Fiberglass still has great shine and no bottom paint, all pumps and lights work. Boat has a lot of teak which still looks great. Lowrance HDS7 combo fish finder/GPS with radar capability. Trailer was rebuilt 2 seasons ago with new galvanized 3500 lb axles, hubs, springs , stainless steel disc brakes, aluminum fenders, LED lights and all new 14" tires. Great boat fishing, crabbing and tubing. Moving up to a cruiser. 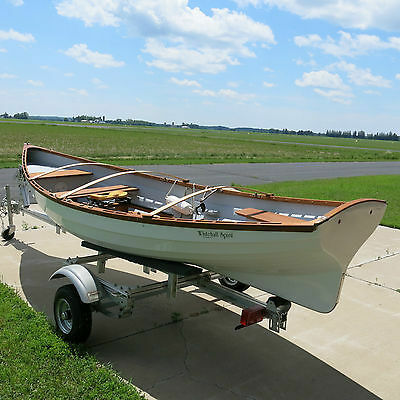 Boat for sale locally. 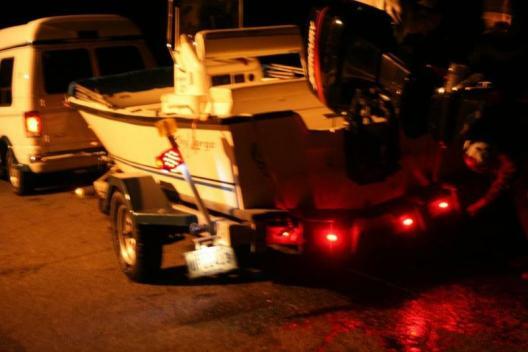 16 FOOT SEMI V ALUMINUM FISHING BOAT WITH TRAILER *** NOTE - BOAT IS ONLY UPSIDE DOWN ON THE TRAILER SO THAT IT DOES NOT FILL UP WITH WATER (EASIER MAINTENANCE FOR ME) BOAT WILL BE FLIPPED BACK OVER FOR CORRECT HAULING*** DETAILS CONDITION: USED BOAT: BOAT IS IN EXCELLENT CONDITION WITH A GOOD TRANSOM & 4 SEATS THAT HAVE BEEN RECENTLY RECARPETED WITH OUTDOOR CARPET. BOAT HAS NO LEAKS AND IS WELL BUILT! 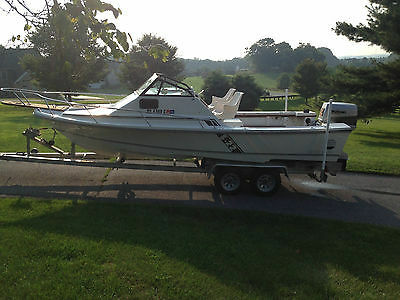 TRAILER: TRAILER IS IN EXCELLENT CONDITION WITH WORKING LIGHTS, GOOD FENDERS, HIGH GUIDE RAILS THAT HAVE BEEN RECENTLY RECARPETED WITH OUTDOOR CARPET, BOAT CRANK WITH STEEL CABLE, WHEEL JACK, ROLLERS FOR EASY BOAT LOADING / LAUNCHING, & 2" BALL HITCH TRAILER LIGHTS: WORK GOOD TIRES: IN AVERAGE CONDITION / HOLD AIR & DO NOT LEAK DIMENSIONS BOAT: 5 FOOT WIDE X 16 FOOT LONG TRAILER: 6 FOOT WIDE X 20 FOOT LONG PAPERWORK PROOF OF PURCHASE: A BILL OF SALE WILL BE PROVIDED UPON ARRIVAL CERTIFICATE: A TITLE FOR THE TRAILER WILL BE ISSUED UPON ARRIVAL PAYMENT DOWN PAYMENT: A DEPOSIT OF $100 WILL BE REQUIRED WITHIN 24 HOURS OF AUCTION END FULL PAYMENT: WILL BE REQUIRED WITHIN 14 DAYS OF AUCTION END AND CAN BE MADE UPON ARRIVAL ITEM WILL BE SOLD UNDER THE FOLLOWING TERMS:THE ITEM WILL BE AVAILABLE BY PICKUP ONLY UNLESS THE BUYER DECIDES TO PAY SHIPPING AND FREIGHT CHARGES AT THEIR OWN EXPENSE. ONLY THE ITEM MENTIONED IN THE AUCTION IS INCLUDED IN THE AUCTION, NO OTHER ITEMS IN THE PICTURES WILL BE INCLUDED WITH THE AUCTION UNLESS OTHERWISE MENTIONED IN THE AUCTION. THE ITEM WILL BE SHOWN AND INSPECTED BY THE BUYER UPON ARRIVAL AND AT THAT TIME THE BUYER WILL HAVE THE RIGHT TO A FULL REFUND ONLY IF THE ITEM IS NOT AS DESCRIBED. ONCE THE ITEM HAS BEEN PAID IN FULL, A BILL OF SALE WILL BE PROVIDED AS A RECEIPT OF PROOF OF PURCHASE. ONCE THE BILL OF SALE HAS BEEN ISSUED TO THE BUYER THERE WILL BE NO REFUNDS GIVEN. UPON SIGNING THE PAPERWORK THE BUYER WILL ASSUME ALL RESPONSIBILITIES OF THE SAID ITEM AND BE IN AGREEMENT THAT THE ITEM IS CORRECTLY AS DESCRIBED. THIS IS ONLY TO PROTECT BOTH THE SELLER AND THE BUYER IN THE CASE THAT AN ISSUE MAY ARISE WITH OWNERSHIP OR CONDITION OF THE ITEM ONCE THE ITEM LEAVES THE LOT. THE ITEM WILL BE DESCRIBED TO THE BEST OF MY KNOWLEDGE AND THE BUYER WILL HAVE THE OPPORTUNITY TO FULLY INSPECT THE ITEM TO ENSURE THAT IT IS CORRECTLY AS DESCRIBED BEFORE BEING COMMITTED TO THE SALE. THANK YOU! We are committed to providing the best customer satisfaction possible. We will gladly refund any defective item and some non defective items. However, we reserve the right to charge a restocking fee of up to 20% of the total purchase price on any return. Within 14 days of the purchase date of your order, you may return products that: Are in their original packaging - Have original manufacturer information - Are not used, installed, or disassembled - Are not damaged due to incorrect use - Do not having missing parts, hardware or instructions / The following orders are not returnable: Custom or special orders - Items with removed tags from them - Items damaged by you - Anything received after 14 days from the purchase date / Once we have received your return, conducted an inspection of the return, and verified that your return meets the above guidelines, a full refund will be issued. Items sold "As-Is" are non-refundable. C.O.D. shipments will not be accepted. Items incorrectly shipped to us will not be returned and will not be refunded. The item will be inspected before the refund is given if anything is damaged, missing, altered, or not in the same condition as it was when you received the item, then the refund will not be given and the item will not be shipped back to you. If you wish to add insurance to the package then let us know and we will add the applicable fees, as if it gets damaged in shipment we will not be responsible that the package was not insured. We offer free shipping on all my items but cannot offer free insurance on all our shipments as well. Thanks for your business and if you have any questions, concerns, or issues with your purchase please contact us first as we can answer and solve most needs within 48 hours without the use of opening an ebay case which can take 1-2 weeks. Please dont forget to leave us positive feedback upon receiving your item as we leave positive feedback as soon as we see your payment post...Thanks Again!!! 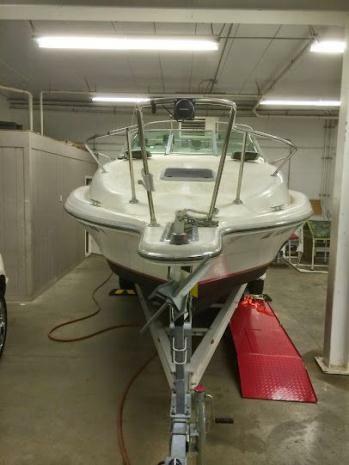 The boat is in very good condition, the engine is a Mercruiser 8V 5,7 Lt. 260HP with original 486 hs., the stern drive is a BravoII with stain steel propeller. On this sale are included the following items: 1 Anchor with 50 ft, rope 2 Fenders 2 Tie down ropes 1 Package with 4 Live Jackets 1 Radio Marine VHF 1 Radio Pioneer 1 Garmin GPS (Air,Land & Water) 1 Garmin Fishfinder C530 1 Autopilot X5 Raymarine (Installed) 1 Refrigerator, 1 Microware, Alcohol Stove, Zinc. 1 Ppal. Bedroom 1 Sec. Bedroom 1 Bathrom And fully working instrument panel.